Always keep your CAYSTON and saline together. 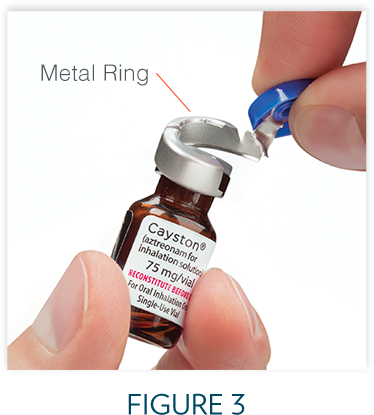 CAYSTON and saline can be stored at room temperature (less than 77°F) for up to 28 days and should be refrigerated at 36°F to 46°F (2°C to 8°C) for longer periods. 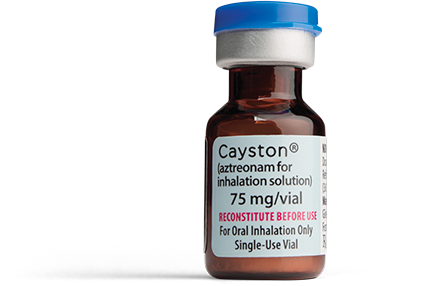 Do not use CAYSTON if it has been stored at room temperature for more than 28 days. It should also be protected from light. Check to make sure that your Altera® Nebulizer System works properly before starting your treatment with CAYSTON. See the manufacturer's instructions for use that come with your Altera Nebulizer System. This should have complete information about how to put together (assemble), prepare, use, and care for your Altera Nebulizer System. You can also click here to view a copy of the manufacturer's instructions for use. Gently tap the vial so that the powder settles to the bottom of the vial. This helps you get the proper dose of medicine. 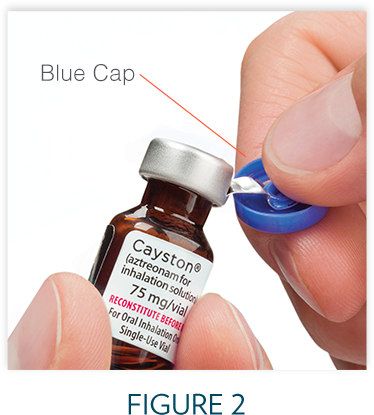 Open the amber drug vial by lifting up the metal flap or blue cap on the top (Figure 1) and pulling down (Figure 2) to carefully remove the entire metal ring from the vial (Figure 3). Safely dispose of the ring in household garbage. Carefully remove the rubber stopper. 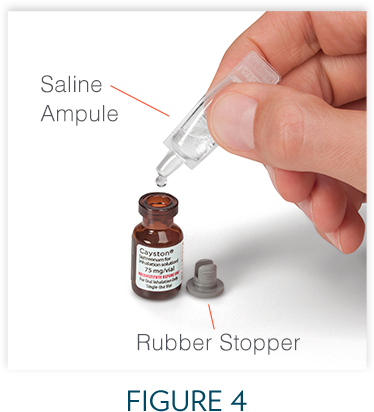 Open the ampule of saline by twisting off the tip. Squeeze out the contents completely into the vial (Figure 4). Next, close the vial with the rubber stopper and gently swirl the vial until the powder has completely dissolved and the liquid is clear. 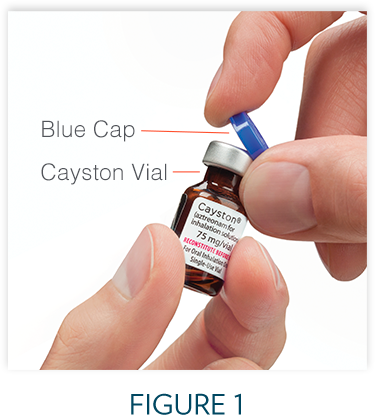 After mixing CAYSTON with the saline, check to make sure the diluted medicine is clear. If it is cloudy or has particles in it, do not use this medicine. Throw away this dose of medicine and start over again with a new vial of CAYSTON and a new ampule of saline. Use CAYSTON right away after you mix with the saline.